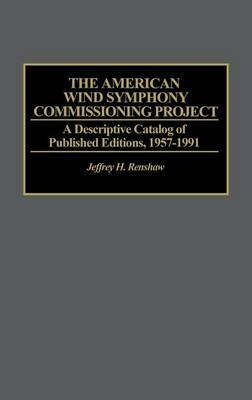 The American Wind Symphony Editions comprises the more than 150 works commissioned by Robert Austin Boudreau for the American Waterways Wind Orchestra and published by the C. F. Peters Corporation. They are here presented for the first time in a complete catalog with detailed descriptive data, biographical information on the composers or arrangers, and score facsimiles. The published music represents about half of the over 300 works commissioned by the orchestra since 1957 in the largest such project in wind instrument history. Presented in this catalog are the published works of 83 composers from 28 countries, including such notables as Alan Hovhaness, Toshiro Mayuzumi, Krzysztof Penderecki, Ned Rorem, and Heitor Villa-Lobos. Genres include original concert and chamber music, incidental and occasional music, and theatrical and pop pieces, as well as arrangements of past masters. The compositional characteristics of each work are described, and data on number of performers, date of composition, duration, score accessibility, composer nationality and dates, and itemized instrumentation is listed. The catalog further provides appendixes classifying the music by composer nationality, duration of works, type of soloist, number of performers, programming category, and other fields. A selective discography is included, as are indexes of works by composer and title. Background history on the wind orchestra and music publisher is also provided.